Sound waves arise when a physical medium like a string on a guitar, a membrane on a drum, or even your own vocal cords in your throat vibrate. When you pluck a guitar string, the string’s vibration causes the surrounding air molecules to vibrate with a similar wave pattern, and those waves move through the air as a compression wave until they reach our ears. There our eardrum receives the wave, vibrates as well, and sends that information to our brain for us to interpret the sound. There’s a lot going on in this whole process, but the neat thing is that we can use math to explore it! 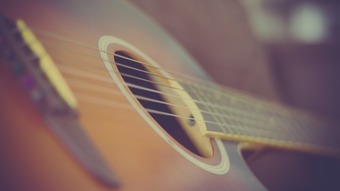 Have you ever wondered why different strings on a guitar produce different sounds? Well, there’s a mathematical relationship between the frequency (f) of the wave in the string, the wavelength (λ) of the wave in the string, the linear density (ρ) of the string (without getting technical, this is affected by what material the string is made out of—how dense it is), and the tension (T) on the string (that is, how tightly the string is held at its top and bottom). Because of the consistent way God governs this universe, we can describe the relationship mathematically, and then use it to design instruments! Since for a given string the tension and material the string are made of (and thus the linear density) are fixed, the frequency multiplied with the wavelength are a constant based on those values. Have you also ever wondered why different notes sound better together than others? It has to do in part with the subtler tones that are also formed when the note is played. When waves are bound (example: a guitar string is attached, or bound, at both sides), they produce not only a fundamental tone, but also what we call harmonics, or subtler tones that are mathematically related to that fundamental tone in a specific way. In the first harmonic, the wavelength is half the original wavelength (frequency is doubled). In the second harmonic, it is a third of the original wavelength (frequency is tripled). And so forth. Figure 1. 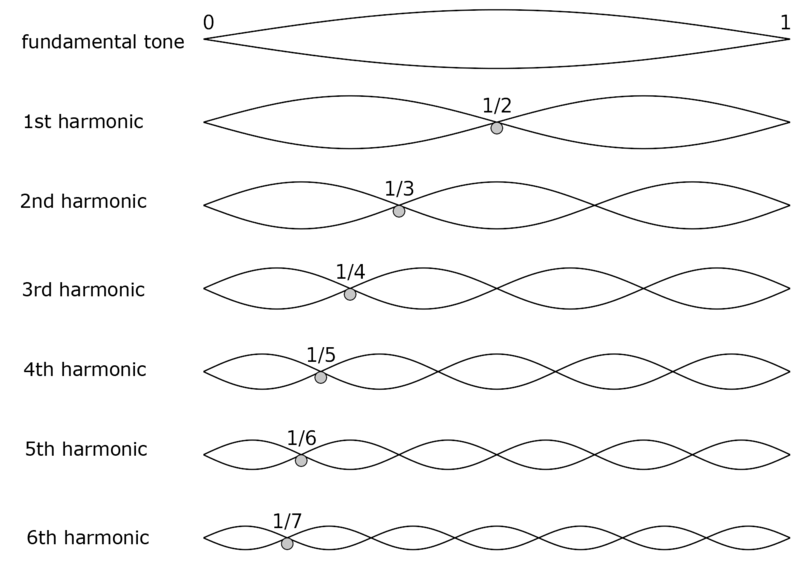 Harmonics on a string. Adapted from WikiMedia. We can use—you guessed it—math to describe how these harmonics relate back to the wavelength of the fundamental tone. Note: In the above equation, n = 1 in the fundamental tone, n = 2 in the first harmonic, n = 3 in the second harmonic, and so forth. Harmonics help us to understand why certain notes sound better together. Harmony actually means “agreement,” and notes that sound good together have “agreement” in the subtler sounds that make them up! For example, the second harmonic of the note C is the note G; not surprisingly, C and G sound good together. When talking about harmonics, you’ll often hear people talk about frequencies instead of wavelengths. We looked at wavelengths here because they’re easier to picture, but as wavelengths change, so do frequencies. To see why, let’s use some simple algebra. We can first divide both sides of the equation that relates the frequency and wavelength by the wavelength to solve for frequency directly. We can do this because of the consistent way God created the laws of math. We can now substitute the equation we have for wavelength in terms of n and L. This leaves us with a way to determine the fundamental frequency and harmonic overtones from just the length of the string, tension, and density. Looking at the equation, we can see that if we make a string tighter (increase the tension), we make the frequency higher and thus a higher pitch. Similarly, thicker strings (larger density) will have a lower frequency or pitch. Longer strings also will give a lower pitch and thus shorter strings a higher pitch (this is why when you hold down strings on a guitar going down the fret board you get higher pitches as you shorten the bound string length). Having different strings together, we can control their individual pitches with these parameters to have integer ratios of their frequencies that give different harmonies, and thus make the beautiful music we hear. Harmonics—which are produced from bound waves—are not constrained to music and sound alone. We just can’t “hear” all of the other kinds of harmonics God put in place in the other kinds of waves He created. For example, in light waves, if a special sets of mirrors are used to only allow light of certain wavelengths to remain in a confined space, only waves of appropriate harmonics are confined. (Side note: This can be used in conjunction with special materials to make lasers.) In the waves of electrons in an atom, the atomic orbitals the electrons can occupy are harmonic in nature, as the electrons are bound in the position they can occupy in space. Since the Bible makes it clear Jesus is the one who created and sustains all things (Colossians 1:16–17), He is the One who has put the incredible order and boundaries we see all throughout His Creation…and math puts a magnifying glass on what He has created, giving us a glimpse into His handiwork we’d otherwise miss. We can only imagine how remarkable it would be if we could “hear” all the harmony of the universe caused by all the waves around us. Looking at the incredible order in waves—which math helps us see—should cause us, like Job, to bow before our Maker, humbled in His presence. Dr. Adam F. Hannon is a data scientist for the company FraudScope where he uses advanced algorithms to aid in the detection and prevention of health care fraud. Before working there, he was a postdoctoral research associate at the National Institute of Standards and Technology, where he conducted research in simulating the self-assembly of complex polymer systems (particularly block copolymer blends) and incorporating advanced inverse algorithms and physics based models into X-ray characterization techniques. He obtained his doctor of science (ScD) degree in materials science and engineering from the Massachusetts Institute of Technology and BS degrees in both physics and polymer & fiber engineering from the Georgia Institute of Technology.